“Something old. Something new. Something Lucky Inside of Your Shoe.” Such was the bride’s rhyme that originated in merry old England…and the reason why every English girl with hopes for a good marriage walked down the aisle with a sixpence in her shoe. The genuine British sixpence, last minted in 1967 is displayed in a keepsake shoe trinket box and is complete with a personalized memory circle and poem. Personalized name may include 10 letters and spaces also choose the year to add a special touch to the memory circle. 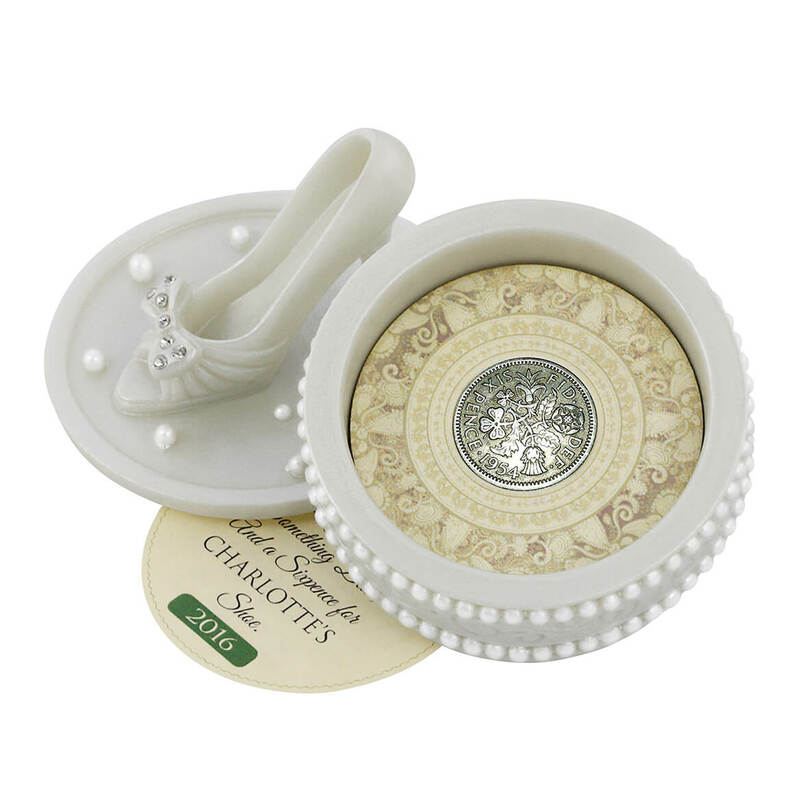 The two-piece trinket box is composed of a poly resin and has a white pearlized finish with a high heel shoe on the top of the box. Genuine 6 Pence Coin Personalized Gift. Keepsake Shoe Trinket Box. Lucky Wedding Coin Poem. Includes A Certificate of Authenticity, 1 Year Manufacturers Warranty. Mint Marks and Years May Vary. 2 1/4″ wide x 2 1/4″ long x 3″ high. Resin, English Coin, Cardstock, Paper. Add a sweet ending to a new beginning with these personalized candy bar wedding favor wrappers. Decked in rich colors and bright white polka dots, the glossy wrappers feature room for warm wishes on both sides. The front reads: “Mr. & Mrs.” followed by 2 names of your choice and a date. We’ll add a custom message on the back for a special treat. Specify front names; limit 12 lines, 14 characters each. Specify date line; limit 20 characters. Specify back message; limit 2 lines, 40 letters/spaces. Chocolate wrappers measure 5 1/4″ x 6″. Candy bars not included. Add a sweet ending to a new beginning with these personalized candy bar wedding favor wrappers. Decked in rich colors and stylish white lines, the glossy wrappers feature room for warm wishes on both sides. The front reads: “Mr. & Mrs.” followed by 2 names of your choice and a date. We’ll add a custom message on the back for a special treat. Specify front names; limit 12 lines, 14 characters each. Specify date line; limit 20 characters. Specify back message; limit 2 lines, 40 letters/spaces. Set of 24 chocolate wrappers measure 5 1/4″ x 6″ each. Candy bars not included.